Who's a clever boy then? 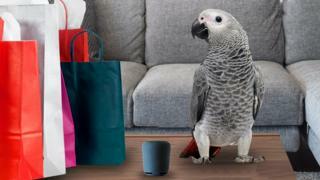 A parrot called Rocco has been placing orders online by chatting to a voice activated device. The parrot swooped in for some early Christmas shopping - buying watermelons, raisins, broccoli, ice cream, a light bulb and even a kite. Unfortunately, those items weren't on his owner's Christmas wish list, but are all the things Rocco likes to eat. Although we're not sure what a parrot needs with a light bulb or a kite. It's not the first time the naughty parrot has been in trouble. He was re-homed from the National Animal Welfare Trust sanctuary in Berkshire because staff thought his bad language might upset visitors. Sanctuary worker Marion Wischnewski volunteered to foster him and took him to her home in Oxfordshire. The African Grey - a breed known for its ability to copy words - added shopping to a virtual supermarket list by speaking to the device. H o w come a parrot eat a kite & Lightbulb??! P a r r o t s D o n ` t E v e n H a v e M o n e y ! ! ! I wish Rocco was my pet, He sound really funny! I wish Rocco was my pet, he sounds so funny! How come parrots eat kites, also parrots don't have money, and the owner didn't say anything! What !? How did this parrot know how to do this? ?